Back in the day, whitewashing, then known as lime washing, was done with salt, water, and hydrated lime mix. Barns, farmhouses and cottages, were liberally painted in this wash as a cheap and easy exterior makeover. Since then, whitewashing is less practical and has taken on a design and style life of its own. In fact, nowadays, it is a tried and true method used by refinishers and DIY-ers all over the world to give wood furnishings, trims, and accents that highly sought after, simple farmhouse look. While it is certainly viable to whitewash any wooden surface, more times than not, this technique is used on reclaimed material or even pallet wood. This is because it allows for craftsmen and women to easily spruce up seemingly any surface quickly and inexpensively. After all, you wouldn’t want to spend hundreds of dollars resurfacing a piece of furniture you picked up at a tag sale for next to nothing. And while some folks claim themselves to be whitewash experts, subscribing to only one technique, like anything else, with modern whitewashing there is more than one way to skin a cat and none of them involve hydrated lime. In this article, we outline three of those methods with a step by step guide you’ll be sure to reference for all of your future shabby chic transformations. Whitewashing with a rag and white paint is great for smooth surfaces. It will give you the same clean, bright finish of white paint, but that beautiful natural wood grain will still show through. In order to create that transparency though, you will have to dilute the paint mix considerably. To gauge how much dilution is necessary, we are going to look at consistency. Where a normal white paint is like syrup, your diluted mix should be more like heavy cream. First, start by creating the mix. Fill a larger plastic mixer with a quart of paint and add a cup of water, then stir. Continue until your mix reaches the right consistency. Using the cups and a quart as our standard sizes, we are able to calculate the proper ratio of water to paint once we’ve gotten that first mix right. Now is the fun part. 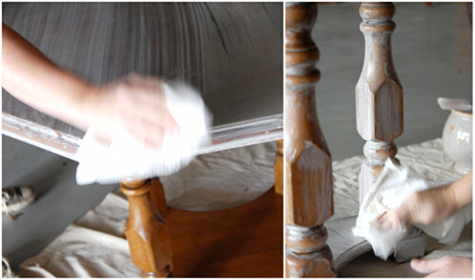 Dip a clean rag into the paint mix and begin wiping it along the surface of the wood. Follow the grain of the wood. Depending on how this coats, you may have to wipe on another coat or two. This is also largely dependent on how white you prefer your finish to be, rather than clear grainy. The scraper method is mainly for reclaimed wood or wood with lots of surface texture and imperfection. First, you must make sure the wood is clean. This is especially true of pallet or fence wood which is treated with heavy chemicals. Once the surface is clean and dry, you can begin applying paint. Use white outdoor paint again. 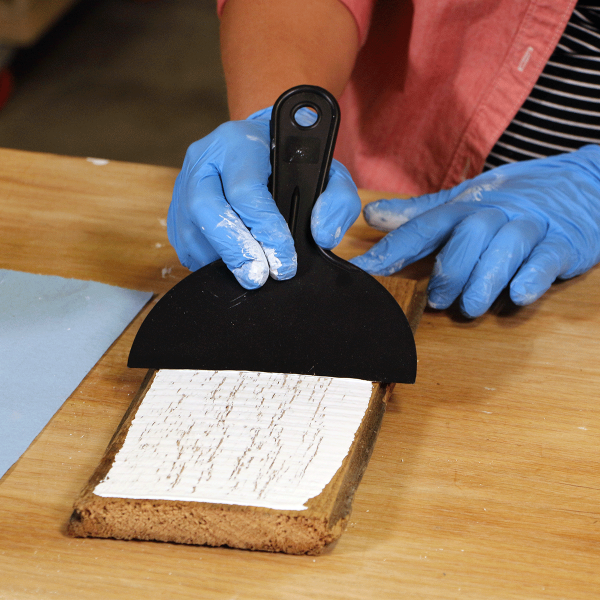 As far as consistency, for the scraper method, the paint does not have to be quite as thin because of the way it is being applied and the surface of the wood. Even if using a brush, it is likely that heavily textured wood would not cover fully for several coats. That said, diluting is likely not necessary. Pour the paint directly onto the surface of the wood. Now, with your scraper, move the paint puddles along the wood grain. 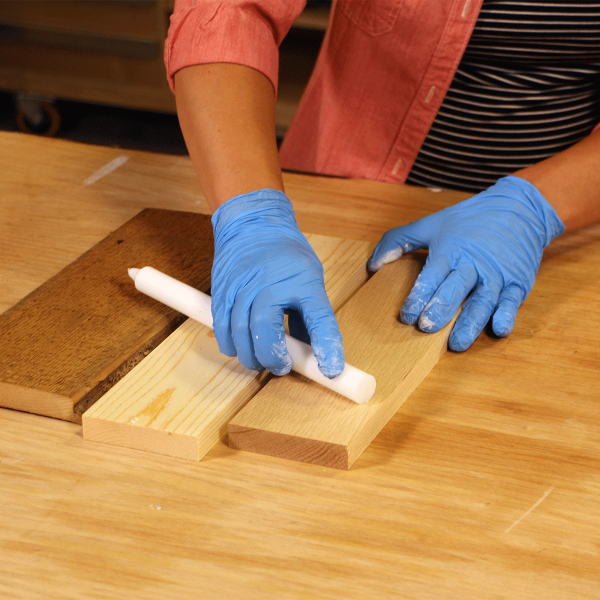 Some parts will soak into the wood really well and others will just skim the surface fibers creating the perfect wash. The candle method will work with both smooth and textured woods, but while more versatile, it is also slightly more labor intensive. For the candle method, it is first paramount that you have…you know…a candle. And we do not mean a Cinnamon Bun scented, brown candle. We are talking about an old school, clear wax candle or any clear wax really. Take the wax and rub it intermittently at points along the wood grain. The wax protect the wood in those spots and keeps the paint from totally absorbing into the wood. Next, paint over the whole of the board completely. Once dry, use a rag and wipe the surface of the paint with some relative pressure. The paint that covered the wax spots will flake off completely giving each board a nicely distributed wash. While no method outlines above is necessarily better than the others, there are some distinguishing factors between the three. A diluted paint technique applied with a rag really should only be used on smooth surfaces. Between the dilution and the applicator, you are going to have a real tough time if you try this one on something textured. On the other hand, the scraper method is perfect for those reclaimed boards with all their imperfections. Finally, the candle method is most intensive, but much more versatile. When in doubt of how a surface will respond to a certain whitewashing technique, this is your best bet.